If you haven’t figured it out from the signs and supplies in the stores, commercials all over TV, and ads plastered everywhere, we’ve started back-to-school time. In honor of this time of year, I’ve come up with 10 back to school planning tips. 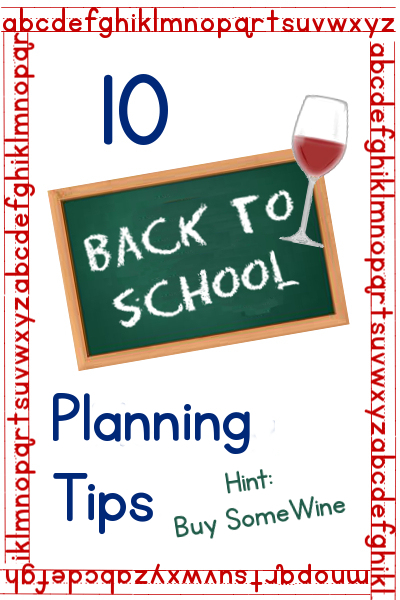 These aren’t your normal back to school planning tips though…hint, buy a bottle of wine! Go through all your kids clothes to see what they have for this coming school year. Learn that one or more of your children has had a growth spurt sometime this summer and you have to buy an entirely new wardrobe. Go through the school supply list you received from your child’s teacher and assess what you can reuse and what you have to buy. Argue with your child that their backpack and lunch box from last year ARE good enough to use again this year. Realize that you have to buy the rest of the school supplies. Go to multiple stores looking for yellow folders only to find out that every store in your area is out of them. Discover that you waited to long to schedule your appointments and your child’s vaccinations will not be up-to-date for the start of school. Call the school and argue with the school nurse or secretary about the fact that your child WILL get their shots. Choke on your wine when you see the cost of these activities. Freak out when you realize that the times of more than one of your children’s drop-off and pick-up overlap and you need to be in two (or three) places at once. Argue with your children about having to go to bed earlier and wake up earlier in preparation for when school starts. Open another one and celebrate because in about a month’s time, the kids will be back in school and your house will finally be quiet again!